AACR, Chicago, Illinois · 2018, Marill J. et al. 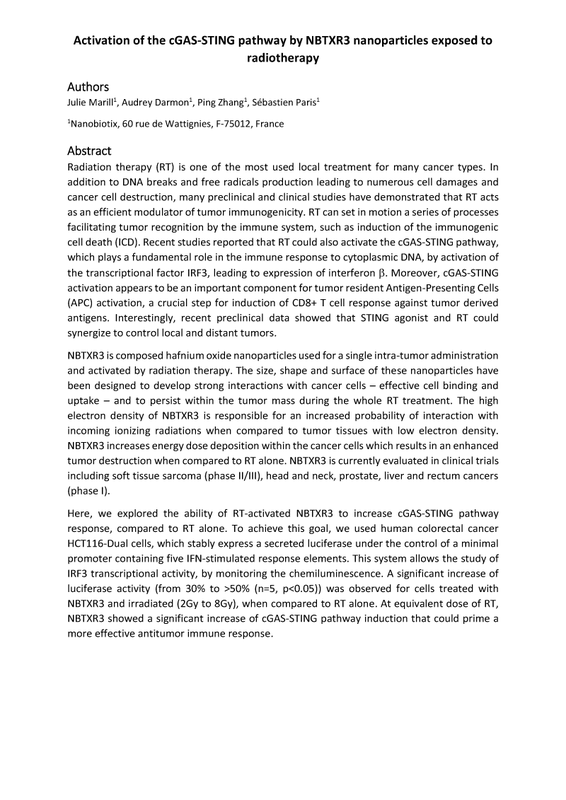 Marill J., Darmon A., Zhang P., Paris S.
Recent studies reported that radiotherapy could activate the cGAS-STING pathway, which plays a fundamental role in the immune response to cytoplasmic DNA, by activation of the transcriptional factor IRF3, leading to expression of interferon-beta. Moreover, cGAS-STING activation appears to be an important component for tumor resident Antigen-Presenting Cells activation, a crucial step for induction of CD8+ T cell response against tumor derived antigens. In this study, it was observed the ability of radiotherapy-activated NBTXR3 to increase cGAS-STING pathway response, compared to radiotherapy alone.